The theme over at I♥Faces this week is "Winter Wonderland". I chose this photo of Alexander, enjoying his first snow. It's been very cold and snowy for a few days now and when we finally got him all bundled and out the door, he was in awe. There weren't any lavish smiles or echos of giggles, only a gasp as the cold air hit his chubby cheeks. I sat him in a rocking chair and he took it all in. Every bit of sky and land he could see was soaked up into his tiny blue eyes. His mouth was open, almost as if he couldn't believe the beauty before him. The snow was still coming down and he sat and he watched it all. Not even the laughter from his sisters tore his eyes from the White, Winter Wonderland. That is WONDERFUL!!! Love his eyes how they POP! Beautiful shot! Love everything about it. so completely sweet!! I love it. The angle is just perfect! what a sweet little one!! I know I already told you but I LOVE this shot of him! 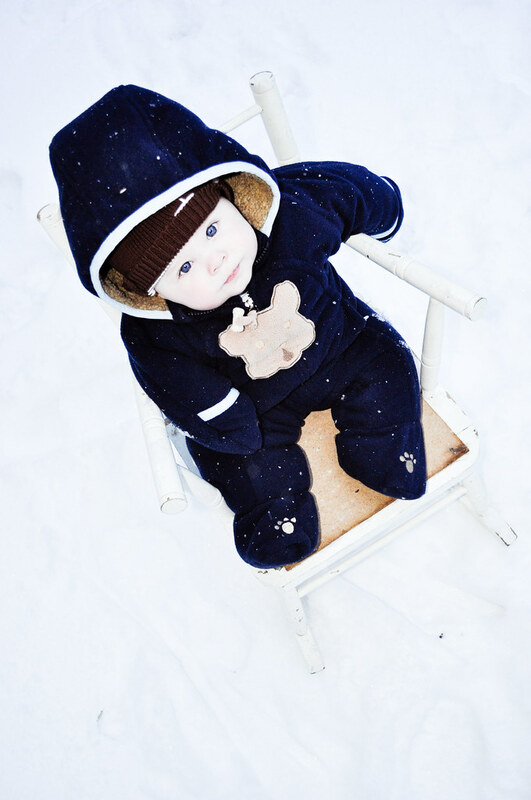 Babies in the snow are always beautiful! Yours, too! It snowed on Christmas Day and I got a picture of my boys in the snow! It was a beautiful gift from God! aww, so cute!! beautiful tones & i love his eyes!! I just super puffy heart this pic. So adorable. ohmygoodness, this is just too cute. I love it!